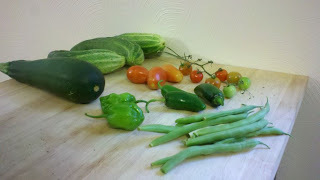 A couple weeks back I had a bunch of cucumbers from the garden and decided to give making pickles a try.... I found a recipe at Serious Eats for Refrigerator Garlic Dill Pickles. Wash jars thoroughly in warm, soapy water. If you plan on making shelf stable pickles, prepare a boiling water bath canner. Put fresh canning jar lids into a small saucepan with 3 inches of water and set to the barest simmer. Wash and dry cucumbers. Remove blossom end. Cut into chips, spears or leave whole, depending on your preference. Equally divide garlic cloves, dill seed, black peppercorns and red chili flakes between jars. 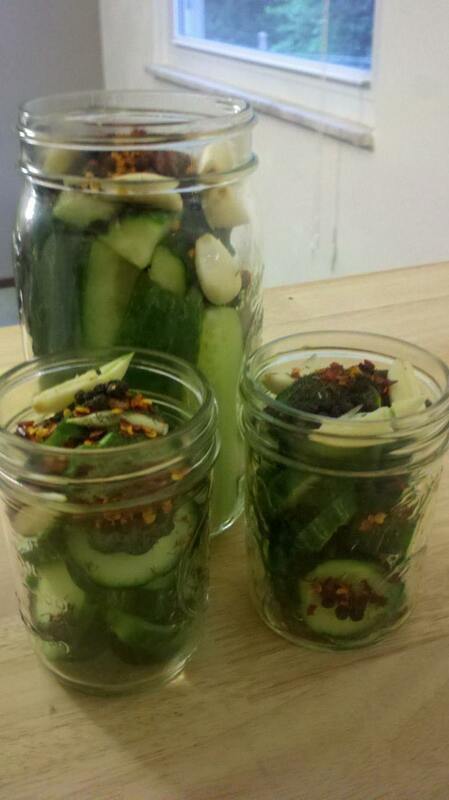 Pack prepared cucumbers into jars as tightly as you can without crushing them. Pour the brine into the jars, leaving 1/4 inch headspace (that's the amount of space between the surface of the brine and the rim of the jar). Remove any air bubbles from jars by gently tapping them. You can also use a wooden chopstick or plastic utensil to help remove stubborn bubbles. Wipe rims and apply lids and bands (don't screw them on too tightly). If processing jars for shelf stability, lower jars into your processing pot. When water returns to a boil, set a timer for 10 minutes. When time is up, remove jars from canning pot and allow them to cool. When jars are cool enough to handle, check seals. If you choose not to process your jars, let them cool before putting them into the refrigerator. Do note that your jars may seal during the cooling process. However, without the boiling water bath process, that doesn't mean they're shelf stable. Still refrigerate. Let pickles rest for at least one week before eating. Tonight we are having our Saturday Night Magic Night Cookout and I've broken out the chips,... Hope everyone likes them! !